It seems the number one question that I get asked on the blog is about paint colors...what paint colors are in our house...paint colors in inspiration I share... let's face it picking paint is tough!! If you've ever had to do it you know it's daunting. So many choices...undertones...and let's not forget the allure of Farrow & Ball ... 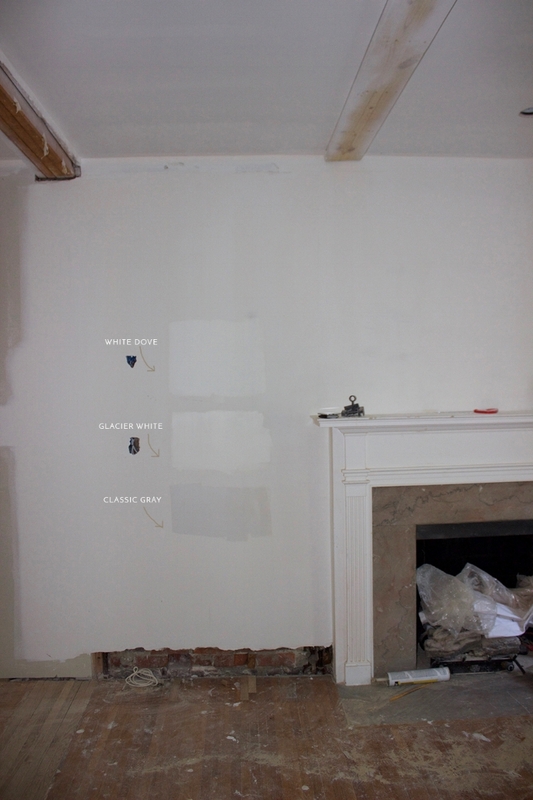 It's so much easier when you can narrow down the colors you like from other people's homes before painting samples on your own walls. No one has time for 30+ samples. Today, I'm sharing my paint picking progress. SPOILER ALERT: They're all neutrals. I remember when I picked our paints the first go-around (when we moved in). I had pretty much a day to do it. I started with Sherwin Williams paints, because I love their quality and then surfed the internet for inspiration. After painting a couple samples on the walls, two colors really stole the show for me... and ended up in nearly every room in our house. 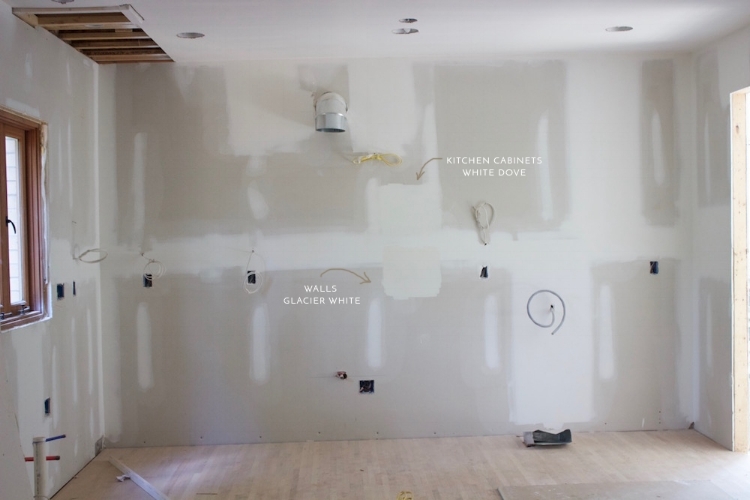 Shoji White is the paint I picked in our old living room, bathrooms and bedrooms. It's such a lovely neutral. It's warm, bright, and really worked with our floor stain, pure white trim and brass accents. Popular Gray was the other winning color. It was in our dining room and office. It's also a warm paint that looks killer with brass accents. The test of a good color to me is if it can be used in multiple rooms in the house with different natural light. 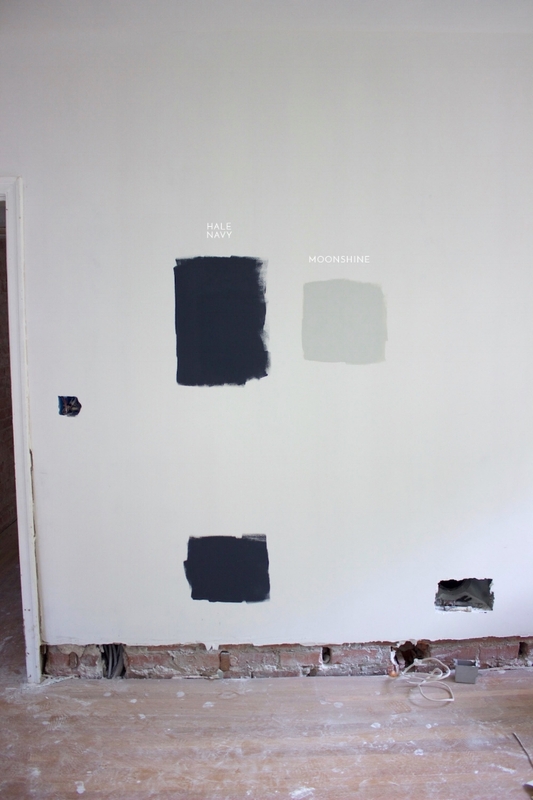 (If you're interested in these colors - check them out in more rooms in our house here.) I loved these colors for the two years we lived with them. I was SO close to just putting the same colors back on the walls. Easy, right?? But with a new kitchen - that will be all white - AND open to the living room AND with trim to paint this time...I went back to Pinterest. When I'm looking for paints I'm always tempted to try colors that aren't always talked about - BUT - there is something to be said for the paint colors with mad hype. 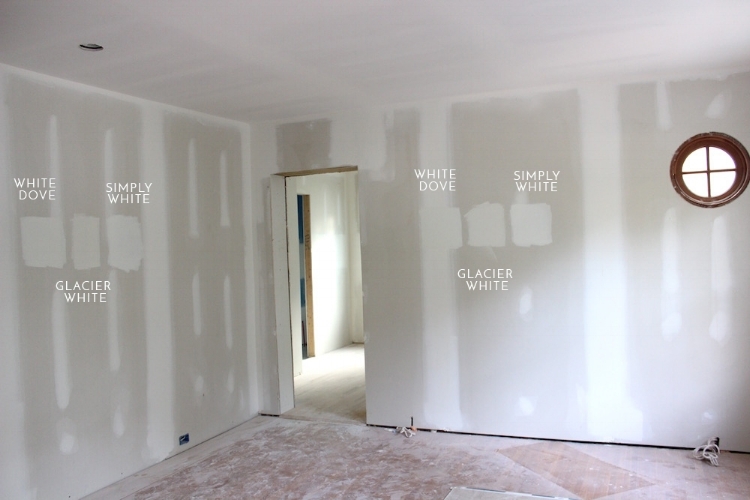 If that many people are going crazy over a paint color especially a white it says something about its versatility. They say when you pick paints for your entire house all at once you should start with the main living space. For my house - that is the kitchen and living room. But...I just ran out of time to get the color right. There were no walls up yet and the kitchen cabinets needed to be ordered!! The timing of our design decisions has been all over the place as we sprint, and I mean SPRINT to get this home renovation done and back into our house. If this renovation has taught me something sometimes you've gotta to cut yourself some slack!!! I have learned SO much about White Dove these past few days. Phew!!!! My husband thinks I'm nuts. He just keeps saying...but it's...white?!? Color can really play tricks on you. With White Dove, when you put it next to a stark or pure white the yellow / creamy tones really show. If you are going for this kind of contrast like Monika Hibb's home - which is LOVELY btw - this is your paint combo. (Her walls are White Dove and Simply White is the trim). If you want it to look truly white, keep reading. The trick is not to put it next to a stark white, then it looks well..white! A lot of people I've seen will paint entire rooms out of this color from walls to trim. In my opinion it looks fabulous, especially with wood work. In the kitchen, the trim color was easy. It has to be White Dove to match the cabinets. The decision was what to do with the walls. White Dove? Or go a bit darker with Glacier White? To me, Glacier White was a bit too yellow/creamy for the white look I'm going for. So, White Dove won for the kitchen and main living space. Side note: Did I mention our new floors are in??? Not stained yet, but man they are so lovely in their true white oak form. Here's the view from the kitchen looking towards our future dining area and stairs. White Dove on top. I went a bit overboard with the paint samples... as my husband likes to remind me ... painting the color on every wall in the room...overkill. Maybe. BUT in my defense, it's a pretty big room and...you...know...light changes...., men. Classic Gray snuck in the mix here, but I'm sticking with White Dove for the walls, trim and ceiling beams. On to the room off the new kitchen. Our future family room meets sunroom (what used to be our old porch before we closed it in). From left to right - old porch to new space. The paint on the walls and trim will be White Dove. The *fun* thing in this room will be the ceiling! It will be a blue to give a nod to our old house, southern architectural history and well my favorite southern city, Charleston, SC, where blue ceilings are a common occurrence. Look at the different hue when it's on the wall vs. ceiling! This is why painting on every wall or the actual space is necessary!! 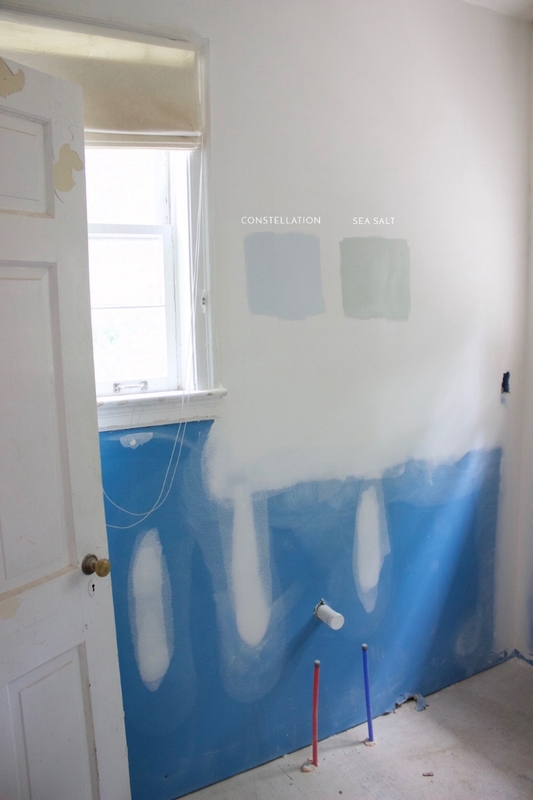 The color is Constellation. In one of the rooms, I really want to go bold with color. If there was a room to do this in the house it would be this next room. It will likely be a study for the time being and I have always want to do a bold blue. Sooooo pretty. Those cabinets, love. The dark paint I tried on this wall is the popular, Hale Navy. I was so surprised by how dark it looked actually on our walls. It nearly looks black. What do you guys think?!? Are you into the blue from House Beautiful camp or Hale Navy? The backup if time runs out this go-around is this pretty blue/green/gray, Moonshine. 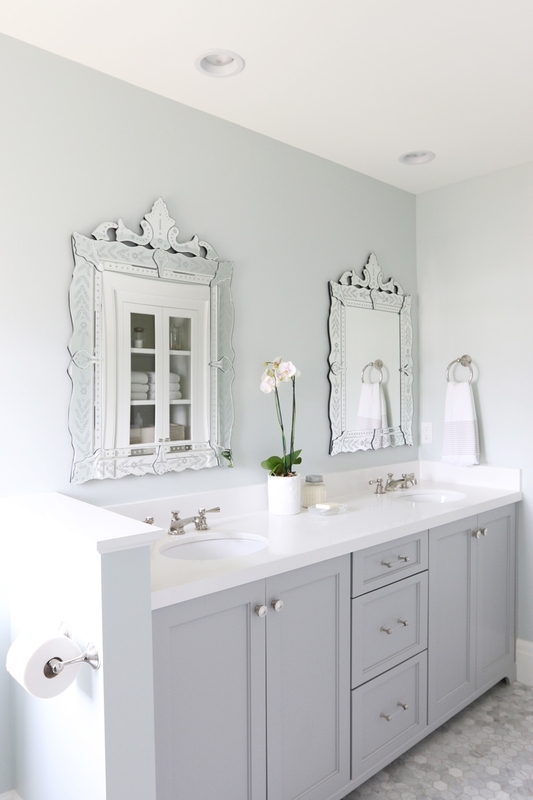 Heading upstairs, we are pretty much going with this whole bathroom look after seeing this lovely color combo on Studio McGee. The walls are Sea Salt. More green in our lighting, but I think it'll look nice. And now to our master bedroom!!! Last go around on paint colors, my one paint fail in my book was our master. We went with a beige...and well, I am not a beige fan. NO CLUE what I was thinking, but it did not look good with our mixed match furniture. Hence why you'll have a hard time finding any photos of our bedroom here... SO! This go around, I am sticking to white for the whole 'master suite'. Simply White was named the 'color of the year' in 2016 and for good reason. 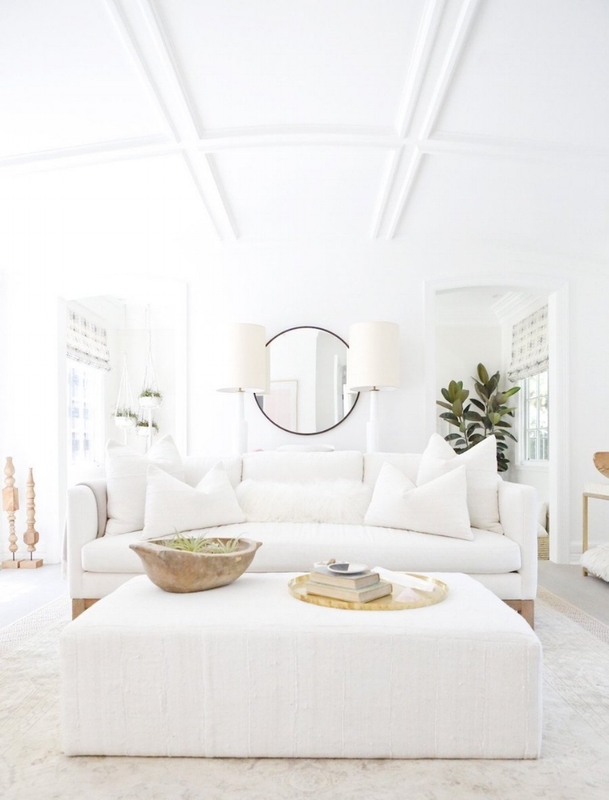 It's a lovely white found in some of my favorite homes like Erin Fetherston's L.A. home. Exterior paint is happening this week and interiors next. Can't wait to get these walls painted!! !